The Enrolled Agent exam, officially known as the Special Enrollment Examination (SEE), is the gateway to the enrolled agent designation, a professional accounting credential. Therefore, the EA exam is a real challenge. However, as you can see from the EA exam pass rates, this exam is still completely passable with proper Enrolled Agent exam prep. To ensure you have all the EA test prep you need, use the tips I’ve compiled here as an IRS Enrolled Agent exam study guide. The I Pass Team may earn a small amount of compensation if you purchase from our links; our team uses these revenues to maintain the site and produce awesome free content just for you! Why should efficient study be one of your top EA exam prep priorities? Once you pass one part of the EA exam, your credit for that part will last for 2 years from the date you passed. Therefore, you must pass all 3 parts of the exam within 2 years to avoid having to retake any part. Because of that Enrolled Agent exam deadline, you need to maintain a steady pace as soon as you start studying for the EA exam. As you know, the more efficient you are, the less time you need to complete a task. Therefore, in the case of the EA exam, the more efficiently you study, the better chance you have of passing the exam in 2 years. 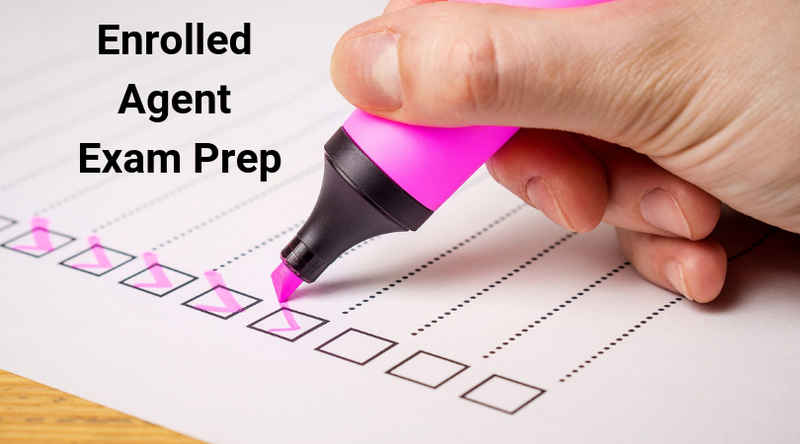 Efficient enrolled agent prep requires 2 things: an enrolled agent review course and an EA exam study plan. An EA review course is essential for EA exam success. You really can’t afford to not use Enrolled Agent exam study materials because an enrolled agent course is the best way to ensure that you review all of the exam content in time for your testing appointment. You may be surprised to learn how critical SEE exam prep is because you’ve heard of an EA who passed the exam just by reading the IRS publications and previous exam questions. If you have heard such a tale, you should know that reading the IRS publications is a very inefficient way to study, as these are meant to be reference materials instead of study guides. Furthermore, the IRS stopped releasing old exam questions in 2005. That was so long ago that those questions now refer to outdated laws and are therefore misleading. Consequently, you can see that the only useful EA exam study materials we have left are EA review courses. And thankfully, there are several excellent enrolled agent courses on the market, all of which I’ve evaluated for you. To get the best EA review course for you, I suggest you find one that fits your knowledge background, your learning style, and your budget. 1. My readers approve of Gleim. So far, Gleim is the only EA review course on my site with 100% positive reviews from my readers and in comments I’ve read on various forums. Gleim EA Review is the most widely used EA review course, and Gleim is the preferred EA review provider of the National Association of Enrolled Agents (NAEA). 2. Gleim has the best questions. The EA exam is non-disclosed. Therefore, EA review providers rely on candidates who’ve taken the exam to provide feedback so that the providers can improve their courses. The Gleim EA Review Course includes access to a team of exam mentors who help candidates prepare for the exam, and these mentors can easily get input from candidates once they’ve taken the exam. This great communication between provider and exam candidate allows Gleim to develop the most high-quality practice questions. 3. Gleim has a free trial. Gleim EA gives anyone who signs up free, unlimited access to the first study unit of 1 section of their Premium EA Review System. Therefore, you can explore the Gleim system as much as you need to and still have nothing to lose. You can sign up here for the Gleim EA free trial. 4. You can save big on Gleim EA Review. Once you’ve finished investigating Gleim EA Review, you can get a great deal on it. With my exclusive enrolled agent course discounts, you can save big on both the Traditional and Premium Gleim EA Review Courses. Here’s my Gleim EA discount (hint: checkout online using the link as the discount is automatically embedded). Create a realistic study plan. Before you crack into your EA review course and do any amount of studying, you need to make a study plan that you can follow until you achieve EA exam success. An EA exam study plan empowers you to work through all of your Enrolled Agent exam study materials in time, schedule the most ideal exam dates, build up your confidence, study habitually for maximum information retention, and experience a smooth study journey. Your long-term goals (like the desire to land an upcoming promotion or increase your income in time for major life changes). To make a manageable study plan, you must know how long it can take to become an enrolled agent. Gleim EA Review suggests candidates spend 80-100 hours preparing for Part 1 and Part 2 each and 60-80 hours preparing for Part 3. Then, you must consider your plans for the next few days, weeks, and months to see where you can fit those study hours into your lifestyle. Once you’ve adjusted your agenda, which may require you to temporarily cancel or cut back on certain activities, you must commit to studying for the EA exam every day and hold yourself accountable for any missed study sessions. With an EA review course and a realistic study plan, you can prepare efficiently for the EA exam. This is because most enrolled agent study materials include study planners. Research shows that spreading out your studying is better than cramming. So, you’ll study more productively by sticking to 15 hours a week for 4 weeks instead of stuffing 60 hours into 1 week. Additionally, you can make the most of each study session when you schedule it for the right time of day. To do so, you must figure out when your body is most awake and your mind most alert. For many people, that time is early in the morning, but that may not be the case for you. So, you must analyze your energy levels throughout the day to know for sure. When you are answering the practice questions in your EA review course, you should alternate between working in study mode and exam mode (if your course has these options). Study mode lets you see the correct answer and the answer explanations right away, whereas exam mode includes a timer that makes you keep moving through questions without stopping to learn from your mistakes. In this way, exam mode emulates the experience of answering all of the questions on the real exam within the time limit. By practicing under exam mode, you can increase your mental stamina and improve your time management. For best results, you should complete practice exams in a cool and quiet place (like the library) so you feel like you’re at the Prometric testing center. While efficient study means studying as fast as you can, effective study involves studying as well as you can. When you study more effectively, you learn more and perform better in the same amount of time. So, how can you study effectively? Conveniently, using an EA review course helps solve for this issue as well. A good EA review course covers all of the content you may see on your exam. Then, a quality EA course also gives you several different ways to learn that information on a deep level so you know it as well as the EA exam expects you to. When you follow the suggested steps in your EA review course and focus on everything you do within the course, you can complete one very beneficial study session after another. However, you can’t leave everything up to your Enrolled Agent exam prep. You must complete a few other key tasks in order to study for the EA exam effectively. Each exam consists solely of 100 multiple-choice questions (MCQs). There are no case studies, simulations, or essays. Total testing time for each exam part is 3 ½ hours (210 minutes), so you can spend an average of 2.1 minutes on each question. One of the easiest ways to keep yourself from getting sidetracked during your studies is to keep your study area clean. If your eyes wander to the stuff around you, your mind will wander, too, and you’ll lose precious study seconds (or even minutes!). Conversely, one of the hardest (but best) ways to maintain your focus is to stay away from your email and social media accounts. Not forever, just during your study time. I know it may sound like I’m asking too much, especially if you plan to study for an hour or two at a time, but you know how powerful these activities can be. Glancing at your friend’s latest post can lead to countless seconds of scrolling through feeds, and then you’ve once again washed a good amount of study time down the drain. For this reason, you should limit yourself to checking your email and social media accounts to scheduled break times or basically any time when you’re not studying! If you need more strict guidance during your studies, you can always try this Pomodoro Technique. It’s a helpful and popular way to balance tasks and breaks. I like it, so you may want to check it out before you start studying. To finish this one imposing task that leads to many lifelong benefits, you’ll probably have to make some sacrifices. These sacrifices are not so bad comparatively, and they are definitely worth it due to how much the EA designation can change your life for the better in the long run. For example, you may have to catch up on that TV show later. Or, you may have to cut back on the time you spend with friends on the weekends. Now, during your Enrolled Agent exam preparation, you can certainly take breaks and have some fun now and then. Doing so is also good for your brain and your well-being. But at the same time, fun and entertainment must take a back seat to your EA exam preparation so you can stick to your study schedule, pass the exam, and move on with your life. You’ve got to reduce short-term pleasures for the sake of long-term accomplishments. If getting enough study time into your week is a struggle, you may need to take these extra steps to ensure that you can study sufficiently before exam day. As with the rest of your EA exam prep, these steps require additional discipline and creativity. However, redeeming any spare seconds you have helps you accomplish more and feel very fulfilled in the midst of your journey to the designation. You certainly need to get enough rest on a regular basis. Success with any activity in your life, not just your exam preparation, depends on plenty of sleep. However, too much of a good thing can be a bad thing. This is the case for sleep when you went to bed on time. If you just keep hitting snooze, you aren’t benefiting from a few more minutes of shut-eye. Instead, you’re simply putting off the inevitable and important duties of the day, like your morning EA exam study session. You’re also prioritizing pleasure, which, as we discussed, you can’t do until after you’ve passed the exam. Therefore, you must thwart the temptation to dream on by taking drastic measures, like putting your alarm clock at the other end of the room. That way, after you’ve walked across the room to turn it off, you’ll be wide awake and less interested in going back to sleep. Another trick I’ve tried to incentivize myself out of sleep is putting my favorite snacks on the nightstand. The chance to enjoy a tasty breakfast is one more reason to get out of bed, and anything that helps you overcome the impulse to stay planted in bed is worth it. Sometimes, you just have to wait. Whether you’re commuting to work, sitting in the doctor’s office, or riding it out on the sidelines of your kid’s sports practice, you often have perfectly good downtime during which you could be studying for the EA exam. When you’re sitting somewhere for 30 minutes or more, you could read a chapter in your review book. If your EA course has a mobile app, you could work through that for 15-20 minutes. Even if you only have 5-10 minutes, you can make the most of them by flipping through flashcards. I made my own flashcards and took them everywhere I went. Consequently, this study resource was both convenient and productive. Even if you use pre-made flashcards, you’ll still benefit from always having EA review materials on hand. You never know when you can dedicate a little downtime to studying. When you’re preparing for the EA exam, you probably can’t keep doing everything else as well. Reviewing for such a significant accounting certification exam is a major undertaking. So, as much as you may want to handle it all on your own, you might need to call in some backup. If your boss or colleagues are understanding of your endeavor, you may ask that they relieve you of some professional responsibilities. But usually, it’s easier to outsource non-vocational tasks such as cooking, cleaning, and managing the house. Your spouse can be an invaluable source of support during this time. So long as they agree that the EA designation is useful to you and your family, your spouse can help cover for you physically and mentally by taking care of the children, providing food, and keeping the house in order. Grandparents and neighbors can also be helpful in different ways. Even if you aren’t sure if they will be up for it, you can simply ask. They might surprise you by being grateful for the opportunity to be of assistance. And as a last resort, you can always hire someone. When control is out of reach, professionals are worth the money. You certainly don’t want to miss out on moments with your family while you’re preparing for the EA exam. For this reason, you should turn study time into a family activity if you’ve got kids. Take them to the library with you so they can read books while you review (everyone has to be quiet there). Or, let your kids who can read use your flashcards to drill you on important topics. Looping family members in like this also lets them see what you are going through and how much it means to you. At that point, they will be more willing to lend a hand in any way they can. As we learned earlier, the EA exam features multiple-choice questions and only multiple-choice questions. Specifically, 100 MCQs on each exam part. So, when you’re not reviewing federal taxation concepts, you should be answering practice MCQs during your study sessions. To score well on these practice questions and build your confidence with the exam format, you should apply these MCQ study tips. According to Prometric’s Candidate Information Bulletin, the EA exam employs 3 types of MCQ questions. Direct question: This type of MCQ simply asks a question. For example, what color is the cat? As you can see, these kinds of MCQs aren’t too tricky. Once you get used to them and know the exam content, you can do well on them. Reading the study guides introduces us to a concept, but answering practice questions solidifies that concept in our minds. The most important parts of each practice question are the answer explanations. When we get a question correct, the answer explanations ensure that we did so for the right reasons. If we get a question wrong, the answer explanations explain why our choice wasn’t the best answer and why the correct answer was. Reading the answer explanations can take a while, but it’s well worth the time. The process of making mistakes and improving our reasoning is one of the best ways to achieve deep comprehension. Discovering and targeting your weak areas is definitely one of the most effective ways to learn. Weak areas would be the content with which you are the least familiar and the concepts with which you struggle the most. When you know what your weak areas are, you can save time by solely reviewing those topics. When you focus on understanding those topics, you can prepare for the worst-case exam scenarios. But once you strengthen your weak areas, they won’t be your weak areas anymore, and you’ll be ready for anything! When your review course includes a tracking system or performance analytics, you can manage your weak areas quite easily and make steady progress with all of them until exam day. You can prepare for every type of question or questions about almost every topic, but you can’t predict exactly which questions you’ll see on the EA exam. Therefore, you may encounter a question that looks pretty unfamiliar. In these instances, you may need to engage in educated guessing. An educated guess is fairly self-explanatory: it involves assessing the answer choices, eliminating the most obviously wrong ones, hypothesizing about the purpose of the question, and picking the answer choice that seems best to you. If you select an answer and then think the other answer might be better, don’t be afraid to make the switch. That extra moment of thought may have just led you to the right choice. More often than not, our first instinct isn’t correct, so if you have time to review your answer and feel like changing it, doing so might be wise. To turn educated guessing into a good habit, practice this process when you answer questions from your EA test prep. When you come to a question you don’t know, do not skip it. Instead, give educated guessing a go, especially when you’re in test mode. It might not feel good, but the more you do it, the less stressful and more successful it becomes. No matter how you come to the answer when you make an educated guess, whether by eliminating answers or recalling information from previous questions, you’ll find that the skill of educated guessing can be critical to scoring well on the EA exam. More goes into answering MCQs on the EA exam than you might think. Passing the EA exam requires you to carefully execute on a thoughtful strategy. And you can construct that strategy by adhering to these testing tips. Because the EA exam contains only multiple-choice questions, managing your time on this test is a bit easier than doing so on exams that include case studies and essays. However, you still need to keep track of your time so you can answer every exam question. You only have 100 opportunities to score points on the EA exam, so you can’t afford to miss a single one. As we mentioned, the total testing time for each part of the EA exam is 210 minutes. This time limit gives you an average of 2.1 minutes to answer each question. Usually, prepared EA candidates can answer most of the questions in 1.5 minutes. Consequently, allotting just 1.5 minutes for your first pass through the questions gives you 60 minutes (1 hour) to review your answers. So, if you get stuck on a tricky question about obscure tax law, you can work on it for about 2 minutes. But then, you should answer it, mark it, and move on. You can always return to it during your review, as you will have answered every question by then. Furthermore, there is no penalty for wrong answers, so you never want to leave a question blank. Even guessing blindly is better than leaving a question unanswered. Therefore, following a time management system that lets you answer every question should be one of your top priorities. The EA exam isn’t here to make every question easy for you. For this reason, some of the answer choices you’ll see will look very reasonable. These plausible answer options are actually there to trip you up (technically, they’re called “distractors”), so looking at them too soon can do more harm than good. With this insight in mind, you should get in the habit of speculating what the correct answer will be before glancing at the answer options. If the answer you came up with matches one of the options before you, then you can be sure that answer choice is correct. When you rush through a question, you’re more likely to pick the incorrect answer. Therefore, you must slow down enough to carefully consider every answer option. Many times, candidates pick the answer that looks correct without realizing that a better answer was available. Avoid this mistake by reading all of the answer possibilities. Doing so is especially critical when “all of the above” is an option because all of the answers are correct. Multiple-choice questions are all about remembering what you’ve already learned. If you’re well prepared and have read the question and answers choices carefully, then your first impression of the intentions of the question is often correct. But if you do get stuck on a question you don’t completely understand, try imagining each answer choice as the correct answer. Doing so can help clarify the expectations of the question and let you feel out the right and wrong answers. Often times, people just feel that one of the answers is wrong. This occurrence is the result of being familiar with a concept but being a little fuzzy on the details. You may find this experience similar to instances in which you know a person’s face but can’t remember their name. At these times, it’s best to trust the impression that comes naturally to you. Throughout your EA journey, you may hear stories about people who put in just 25 hours and passed. But then, you may also learn about hardworking candidates who answered more than 3,000 questions during their preparation for all 3 parts. So, how do you know what route will work best for you? Here’s the bottom line about EA exam prep: You can pass this test if you put in the work. You may need to put more or less work in than other candidates, but the only thing that matters is that you do as much as necessary to be completely prepared. Study the concepts/rules, not the questions. Ask why if you don’t know the answer. Understand the question and what the examiners are asking. Don’t study the day before the test. Go do something that day and RELAX, and if you fail, don’t get discouraged. Now that you’ve got your enrolled agent study guide, you need your Enrolled Agent exam study materials to go with it. I’ve analyzed the most popular EA review courses on the market and made my recommendations. Consider my pros and cons along with your current knowledge levels and learning styles to find the best course for you. Then, use my EA review discounts to save big on your enrolled agent prep. Please let me know if you have any other study suggestions so we can all learn together. I wish you the best with the EA!